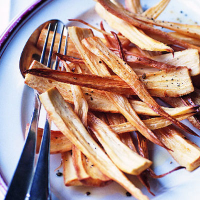 Perfect roast parsnips – crunchy on the outside, creamy in the middle – need to be cooked in hot oil, ideally at the same time as the roast potatoes. Preheat the oven to 190°C, gas mark 5. Spoon the oil into a roasting tin and heat in the oven. Meanwhile, peel the parsnips and cut lengthways, or in half or quarters, to form even-sized pieces. Carefully add the parsnips to the oil. Turn to coat. Roast for 40-45 minutes, until golden, turning halfway through.